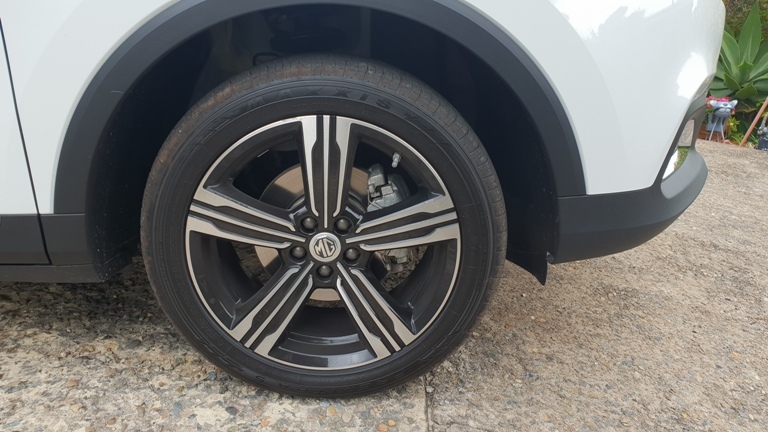 Car Review: 2019 MG ZS Essence SUV | | A Wheel Thing. 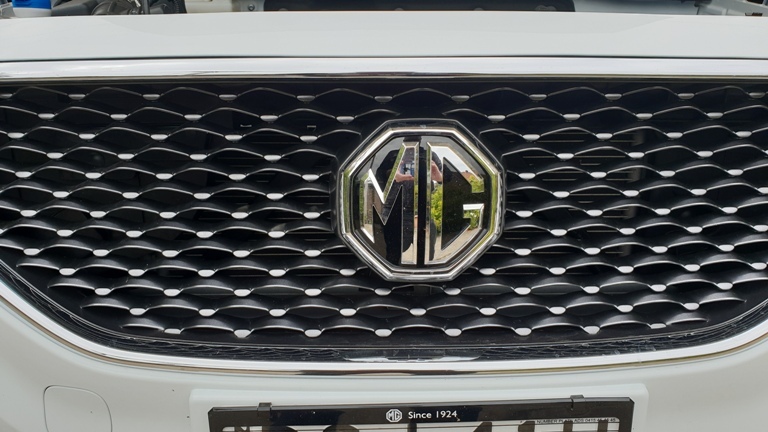 A Wheel Thing welcomes a new brand to the AWT garage, MG. MG itself is Morris Garages, once a name held in the same regard as Lotus and Caterham thanks to its sporty range of little two seater sports cars. However that link to the British history is about all that is left. The company is now owned by Chinese conglomerate SAIC and the brand’s range itself is a long way from the sporty little two seaters that made the company a household name. 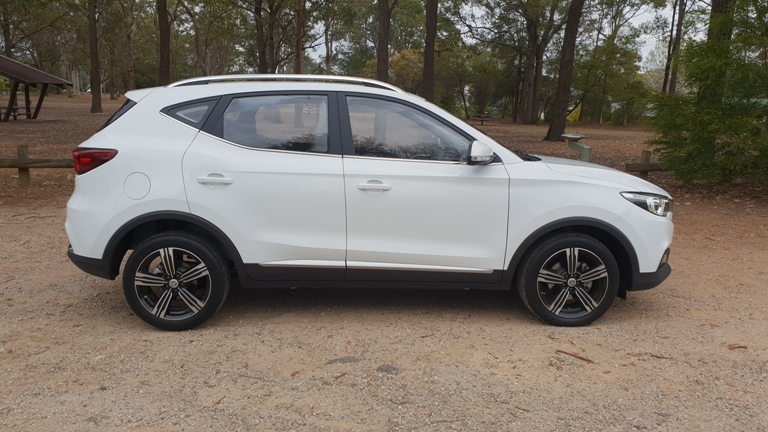 There are four models available, the MG6 sedan, MG3 SUV, MG GS SUV, and the range topping MG ZS SUV, with two trim levels. 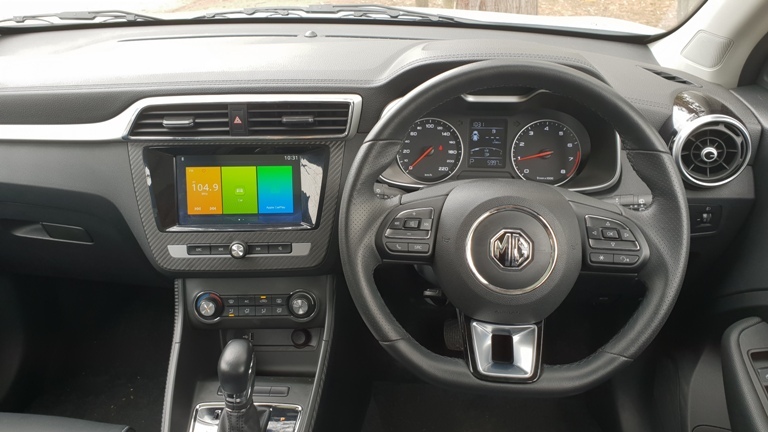 AWT drives the 2019 MG ZS Essence, complete with panoramic “Stargazer” glass roof, six speed DCT, and a 1.0L turbocharged three cylinder. The pair starts with the 1.5L four speed Excite, and at the time of writing was on a special drive-away price of $22,990. The Essence is currently on $25,990. The three potter has that familiar thrum peculiar to three cylinder engines, and delivers 82kW @ 5200rpm, and 160Nm between 1800 to 4700rpm. Although that’s a great spread of revs it’s got to pull, via the front wheels, a 1245kg machine, plus fuel, plus passengers. 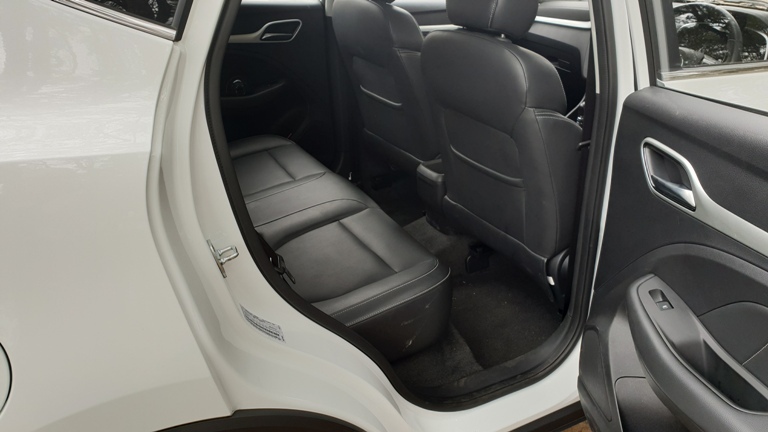 This immediately puts the ZS on the back foot in overall driveability, with performance noticeably blunted with four aboard, compared to a single passenger. 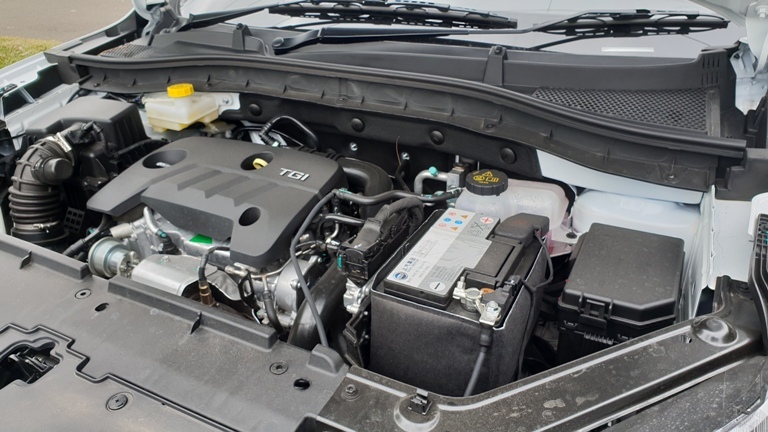 The engine comes paired with a six speed DCT, or dual clutch transmission, and makes a good fist of it here. It’s mostly smooth, bar the typical DCT stutters between Reverse and Drive, and at speed was quiet and almost seamless in changing. The weight and lack of torque is dealt with by judicious use of the accelerator. Rather than punching the go pedal, a firm and progressive squeeze yields better results from a standing start. Revs climb willingly, the cogs shift appropriately, and the economy hovers around 8.0L/100km. MG quotes a combined cycle of 6.7L/100km and a city cycle of 8.4L/100km. 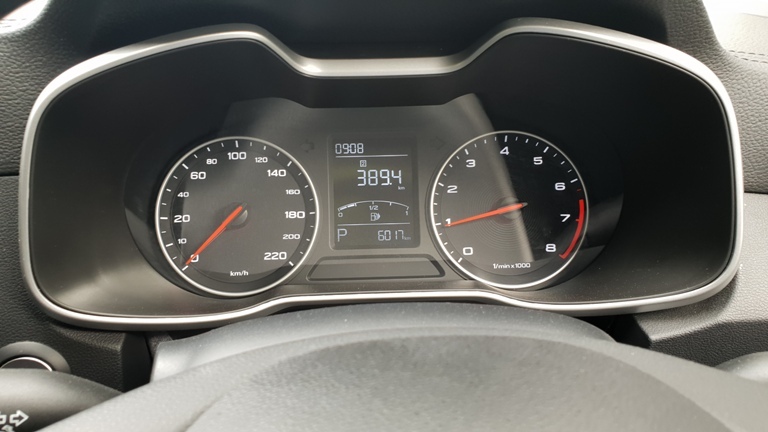 In a purely city based environment that in itself sounds good but the ZS has just 48L in the tank, and after just shy of 500 kilometres of travel the tank needed a quick top up on the way back to its home base. MG also specify 95RON too, which makes for slightly more expensive attack on the hip pocket. Ride and handling are a mixed bag. The steering is light, but not a featherweight in feel. The ZS changes direction quickly and without effort. But some of that comes from the suspension setup. Initially it’s hard, harsh, and picks up smaller road objects such as the reflective “cat’s eye” markers too easily, and it’s tiresome very quickly. That same setup has the chassis move around on the road, and with sweeping turns pocked with expansion joints, the ZS skips around noticeably. Over bigger lumps the dampers soften and absorb bigger obstacles such as the speed restricting bumps in school zones well. The MG ZS fits well in the compact SUV segment. There’s an overall length of 4314mm, a width of 1809mm that includes the mirrors, which makes interior shoulder room a mite snug. It stands just 1644mm tall and packs a 359L cargo area, in a low set design, inside the 2585mm wheelbase. 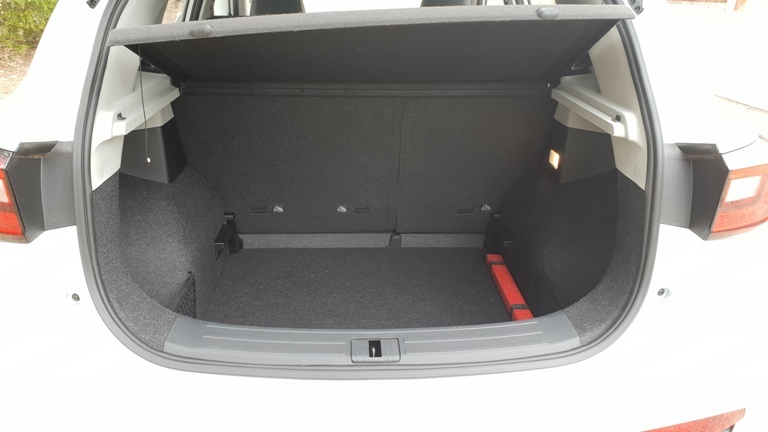 Fold the rear seats and that cargo jumps to 1166L. On its own the low set cargo floor helps in loading and removing the weekly shopping. Getting in and out of the ZS was also easy thanks to the wide opening doors. Build quality was pretty good, with only a few squeaks, and one of the cargo cover pins refusing to stay plugged in noticed. 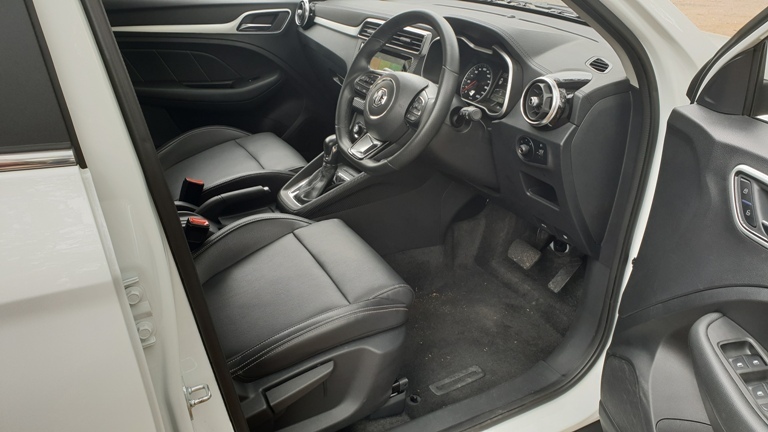 The trim level itself is a pleasing blend of faux carbon fibre, flat and piano black plastic, and black man made leather seats. Unfortunately there is no venting in the seats and, on the sunny days experienced during the review period, were uncomfortably hot. Entertainment comes from an eight inch colour touchscreen. Apple CarPlay is embedded, Android Auto is not. FM sound quality was fine but if you want DAB you’ll have to stream it via a smartphone as that isn’t featured either. Interestingly, there is a Yamaha sound field program for the audio, which although making an audible difference between a single versus multi-person choice, is of questionable value. There didn’t appear to be RDS or Radio Data Service either, which gives you station ID and song information. The driver has a simple binnacle to deal with, sporting a pair of dials and a truly out of date LCD screen. This is a design that has the thin LCD line style of display and in an era of full colour screens with a better layout, this stands out as an anachronism. The tiller holds the tabs to scroll through the info available on a horizontal basis but didn’t seem to load anything using the up/down arrows. Attached to the manually operated steering column is the cruise control stalk, with a speed limiter alert fitted. Again there didn’t appear to be a simple method of disengaging this as it would produce an irritating chime with a buzz note when the legal speed limit was reached. Outside the MG ZS has styling hints from Hyundai and Mazda, not entirely a bad thing here. There’s good looking LED driving lights in what they call the “London Eye” up front, a Hyundai ix35 style crease at the rear, and a bluntish nose not unlike Mazda’s CX-5. However, the 17 inch wheels (with 215/50 rubber from Maxxis) look too small, especially in the rear wheel well arches. They’re too wide to provide the right proportional look for them. When it comes to safety the MG ZS Essence is well equipped but misses out on Autonomous Emergency Braking. There are six airbags, not a driver’s kneebag, the basic emergency driver aids but no Cross Traffic Alert, Blind Spot Detection, and the like. 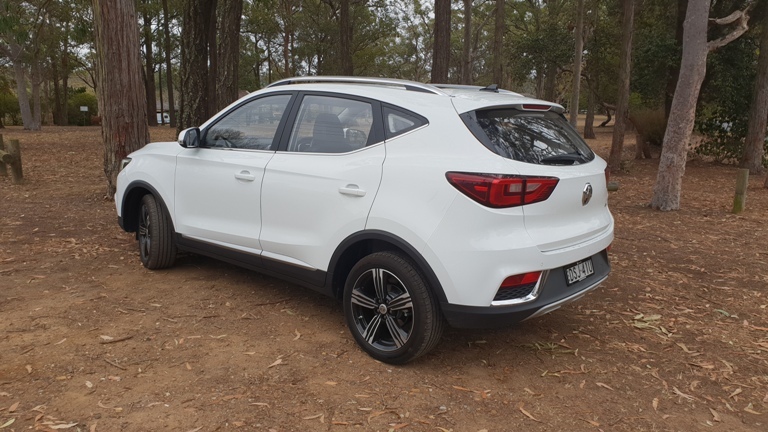 The 2019 MG ZS Essence is neither a bad car nor a good car. It does what it’s asked to do but offers no more than that. It drives well enough but needs a 1.5L or 1.6L engine with a turbo to overcome the performance issue. It’s comfortable enough but venting in the seats would be nice. The ride is ok but the jittery part of it, which is most of the time, would quickly become tiresome. The dash looks ok except for the 1980s style info screen. Here is where you can find out more. 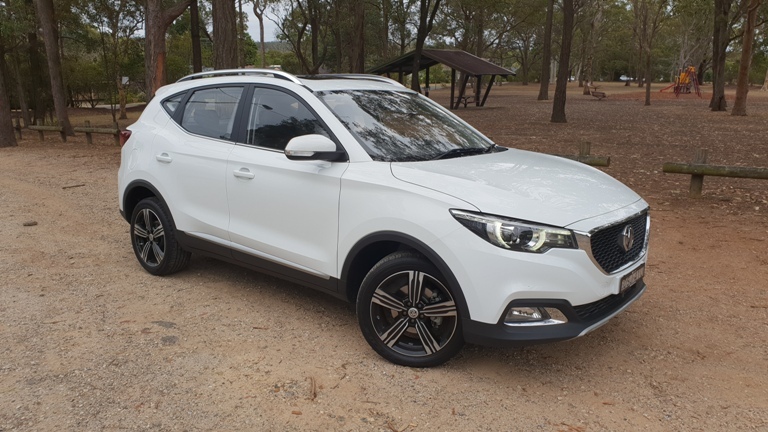 Be the first to comment on "Car Review: 2019 MG ZS Essence SUV"